There are only a few places in the world where you feel great getting up in time to watch the sun rise. The Cape at Cabo San Lucas is one such place. Baja Anglers specializes in fly fishing and light tackle fishing with spinning rods/reels or bait casting gear. We have only the highest quality fly and spin gear on board our boats at all times. If you are a fly fisherman we have Sage and G.loomis rods with Abel and Tibor reels and loaded with RIO fly lines. Only the best. If you like spinning, we have light G.Loomis and TFO Spinnig rods with Shimano reels loaded with braid Spiderwire. The Sea of Cortez is a giant fish trap. Warm waters with shrimp, squid, sardines, herring, mackerel and other food flow to Pacific predators like blue marlin and Black marlin, striped marlin, yellowfin tuna, dorado (mahi mahi or dophinfish), and wahoo. Close to shore roosterfish, jack cravelle, Sierra mackerel, red & cubera snapper, 3 kinds of trevally, yellowtail, black skipjack, pompano, grouper, lady fish and others abound. Fish come to Cabo San Lucas, Mexico for the feast. We invite you to come for a fly fishing or light tackle fishing experience you will remember for a lifetime. When your fishing day starts, when the sun rises over the East horizon and the harbor is alive with with anticipation; when you motor out past the arch rocks with a chorus of sea lions barking and frigate birds circling; when you spot whales spouting and breaching; when dolphins glide across the waves to play; all this before the first hurrah of "fish on". 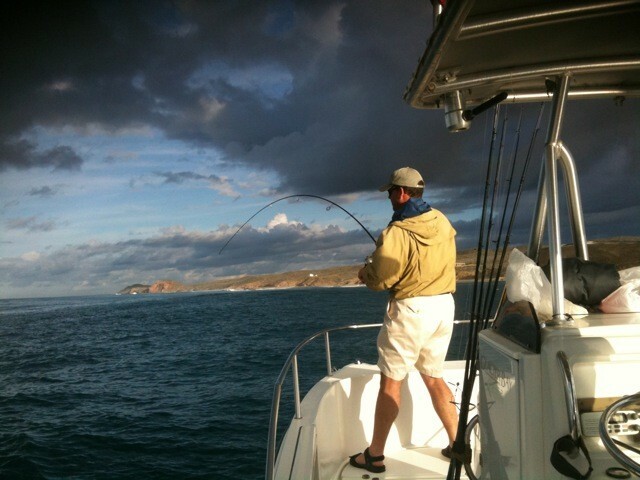 Then you will know the true joy of bluewater fly and light tackle angling with Baja Anglers. But when the fish do come to test you, you will also know you and your Baja Anglers team are ready and able to handle the challenge. We have trained ourselves to help fly fishers and light tackle anglers do their best. After all, this is really why you come here. One call to Baja Anglers can set you up with the exact fishing schedule you want to enjoy while you are in Cabo San Lucas or San Jose del Cabo. You can fish every day, fish for world records (we have over 90 world records in the shop now), fish for pure fun with friends or family. 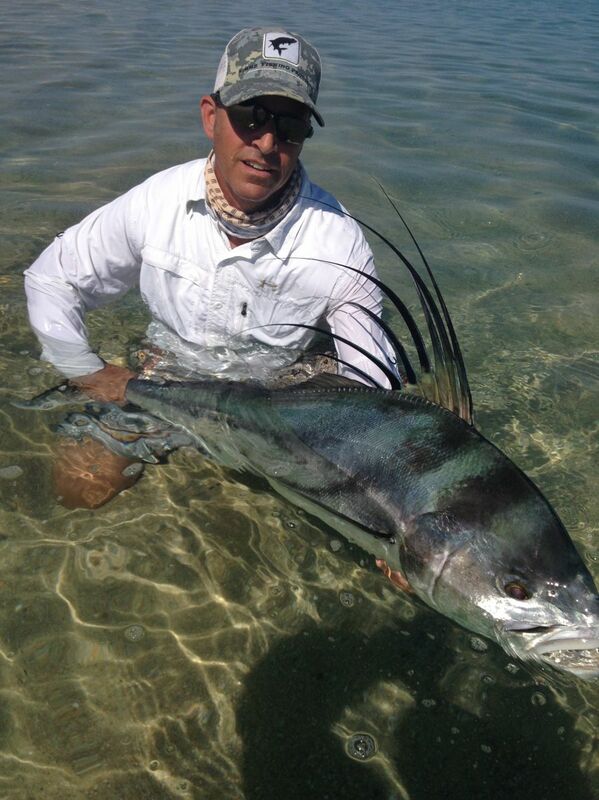 We practice catch and release on all billfish, and roosterfish. Keep a dorado, tuna, wahoo, pompano, grouper or Sierra mackerel for the table. Check the testimonials listed to learn what others think of our service. Know that we want you to come back and fish with us again and again. 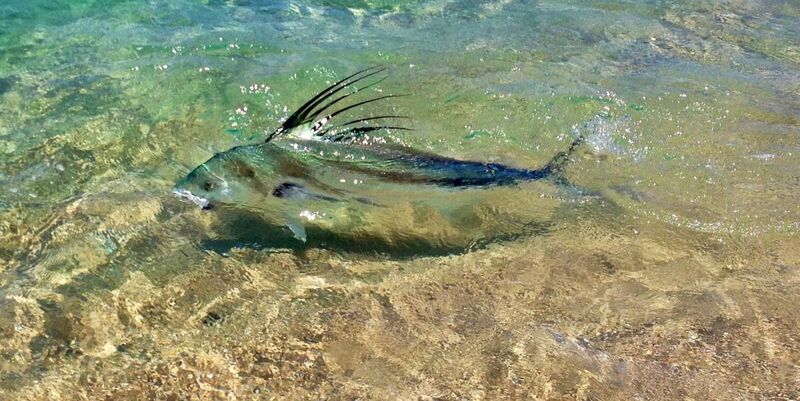 Its time to check out Grant's beach Roosterfish Safari's. I’m a saltwater fly fishing fanatic. 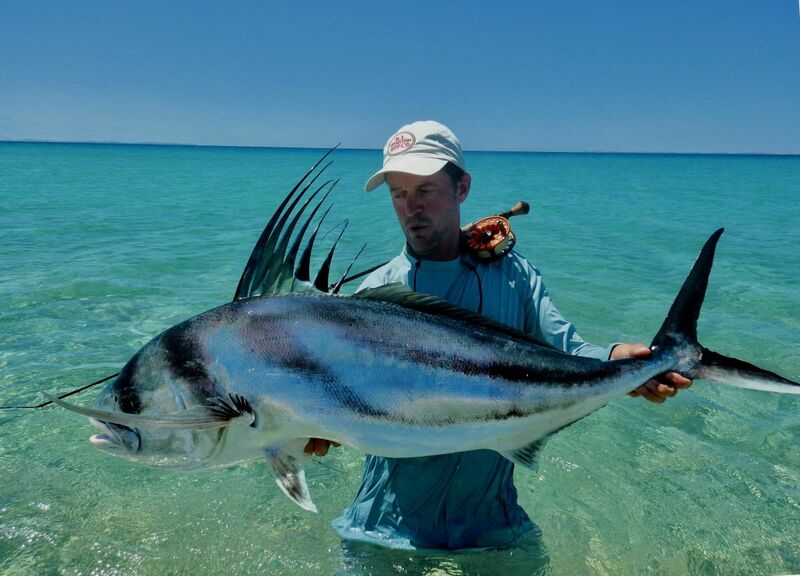 I thoroughly enjoy wading the flats, I’m passionate about throwing poppers over coral heads and I’ll fight a yellowfin tuna with the best of them in the bluewater. 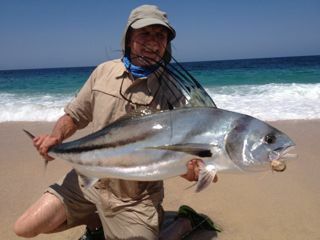 But I love nothing more than walking the beaches of Baja with my good friend and top roosterfish guide Grant Hartman. After years of chasing roosters on my own I thought I knew how to catch them. But then I met Grant. 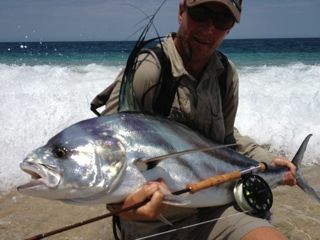 There is absolutely no other guide or angler that can help catch a roosterfish off the beach better than Grant – NO ONE! 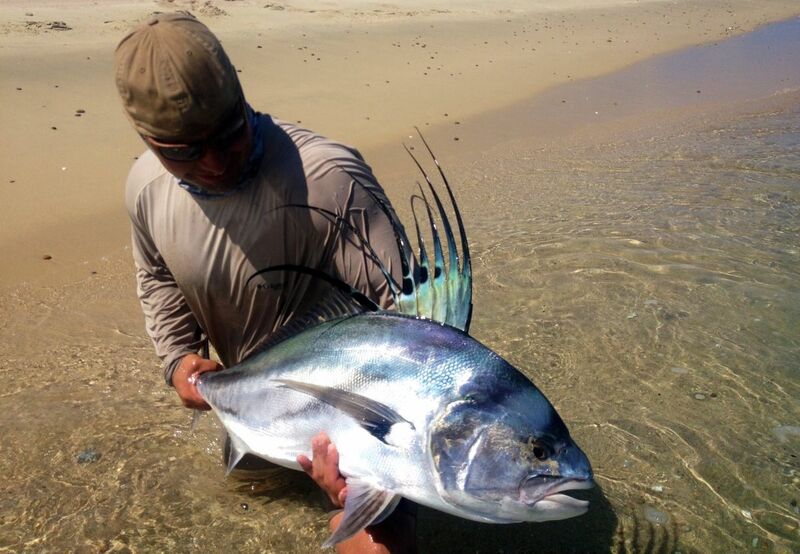 “My sons and I spent a week last June fishing with Grant for roosterfish on the East Cape of Baja. It was a fantastic trip and Grant was the perfect host and guide. He is THE original expert on fishing for rooster fish from the beaches, period. He not only worked tirelessly to teach us how to pursue this elusive trophy fish, he also was fun and informative. He taught us about the Baja ecosystem and the history and culture of the area. Grant gave us no-nonsense casting instruction and exercises, and by the end of the trip we all had improved our casting tremendously and were rocketing casts far out into the surf. The accomodations and restaraunts he set us up with were great too. We had such a spectacular time that before we had even left Baja we were bugging Grant and trying to get him to let us book for next year already. I’m even trying to find a way to get away for two weeks instead of one this time! It’s a no-brainer, if you want the best captain and guide in the Baja, book Grant.” Anthony Smith N.M.